Summer and fall at Syracuse University bring an energized spirit to campus that fuels a jam-packed schedule of enjoying the sunny weather while it is here. The folks at the Department of Recreation Services know how to make the most of the warm weather by offering multiple outdoor adventure trips. Whitewater Rafting on the Black River is back by popular demand this year. Students are invited to join recreation services for a full day of rafting, from 10:30 a.m. to 6:30 p.m., on the Black River in Watertown, New York, on Sept. 2, 8, 9, 15, 22 or 23. For $30, SU/ESF undergraduate students are given round trip transportation from College Place to Watertown, all rafting and safety equipment, guided trips, snacks and drinks, and a barbecue dinner after the trip. The trip is $85 for all other valid SU/ESF ID card holders. 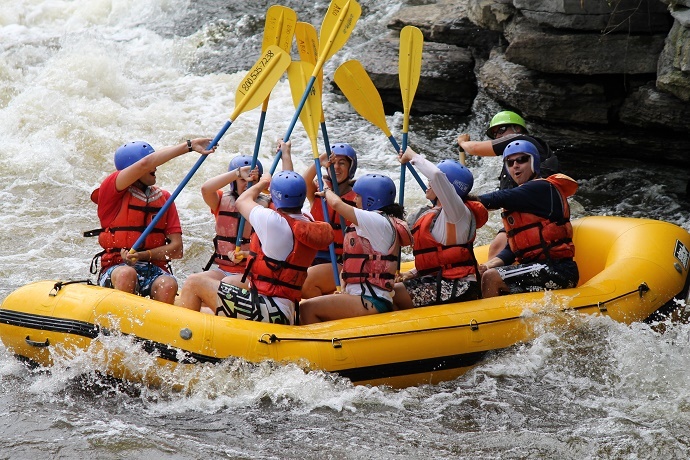 Registration for Whitewater Rafting is required, and attendees must print, read, sign and return the Adirondack River Outfitters waiver to Scott Catucci, associate director in recreation services, in Room 003 in the Women’s Building, at least three days prior to the trip. Hannah Butler ’18 in the Newhouse School is excited for her fourth and final Whitewater Rafting on the Black River trip. Another exhilarating outdoor adventure experience is Downhill Mountain Biking at Greek Peak. The downhill mountain biking adventure is a four-week program, in which students can sign up for either Saturdays or Sundays starting Sept. 15 or Sept. 16. There are only 15 spots for each day, and registration is open to only undergraduate students. The cost of the four-week program is $100. To register, contact Julie DeLeo, program coordinator in recreation services. Registration closes Sept. 12. Whitewater rafting and downhill mountain biking aren’t your thing? Be on the lookout for more outdoor adventure trips, including apple picking and horseback riding, this fall semester. Contact Catucci for more information or accommodation requests.